In an age of ever-accelerating technology, convenience, and disposable consumer culture, many men feel increasingly disconnected from the traditions and skills of their ancestors. A new generation of men are rediscovering the lost ways of their grandfathers and great-grandfathers, including in the realm of personal groomin﻿﻿g. In the 21st century, we've seen not only the revival of the beard, but also the return of older tools and techniques of trimming, sculpting, and shaving our manly face hairs. One such tool, a welcome addition to the kit of the contemporary Renaissance man, is the noble, stately, yet humble straight razor. 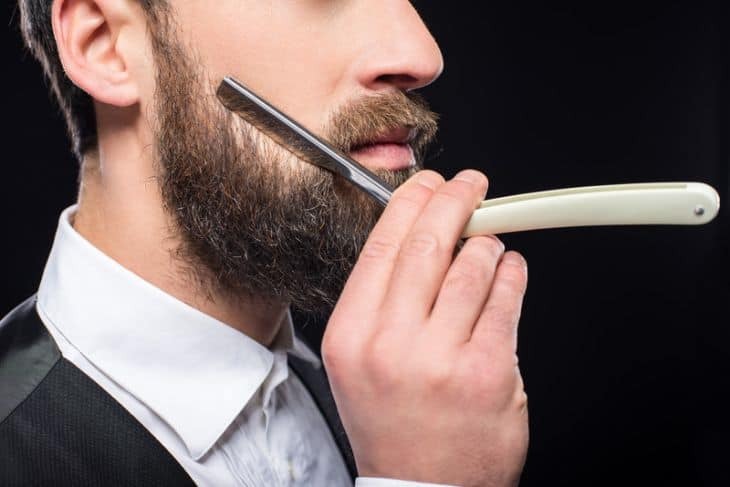 We take a look at the traditional straight razor or cut throat razor and also its modern popular form known as shavette. 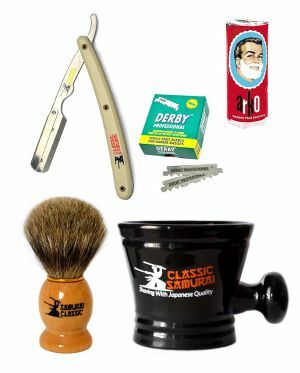 Find out which are the most suited for beginners who want to start their wet shaving experience using a straight razor. Also known as the “open” or “cut-throat” the straight razor traces its origins to late 17th century England. The tool at a glance instantly brings to mind raw masculinity made refined through the combination of superior craftsmanship and skilled personal grooming. 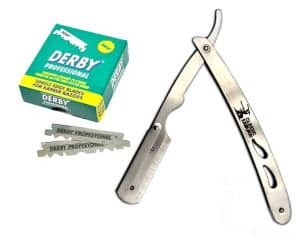 Traditionally made of highly polished Sheffield steel, straight razors quickly became Europe's, and then the world’s, dominant way to shave, until the quick rise of safety razors from the late 19th through mid-20th centuries. Though safety razors was sidelined by cartridge razors and electric shavers nowadays, it is still in vogue. Same is the case with straight razors. Nowadays you can get “shavette” straight razors that can be used with disposable razor blades. There is no doubt that the straight razor requires a skilled hand, and can often run you anywhere from a hundred to several thousand U.S. dollars. However, these stately tools, if properly cleaned, sharpened, and stored, will serve their masters for a lifetime, and bring a great deal of meditative engagement and discipline to a man's morning routine. Holding a knife to your own throat every morning carries its risks, and thereby a necessity for preparation, attentiveness, and learning. Even in the most careful of hands, the first couple dozen shaves with a straight razor are nearly certain to bring a barrage of nicks and cuts to the beginner's face. But, if you're willing to equip your hand as well as your mind properly for the task, you too can raise your mastery of the lost barber's art. Feather is a classic Japanese brand who knows how to give their product that refined tactical aesthetic. The stainless steel body is compact, folding handle are both durable, truly giving you your money's worth. The grip is comfortable, and gives individual users flexibility in their style of holding the razor. The shaving head is rounded to minimize cuts and the enamel handle is made from resin that can withstand temperatures up to 135 degrees. The shaving head has a spring-mounted, one-touch mechanism for r﻿﻿eplacing the blades easily. The blade will pop out by simple pinching the razor head. It gives best results when used with Feather Professional artist blades or Kai’s blades. They are sharp enough so newbies need to use them with caution. Overall the Feather is a well-engineered, light and balanced razor that suits all kind of wet shavers that offers a silky smooth shave. If you're looking for high quality, high style, and ease of use for a good price, then Feather is your best choice. Equinox Professional straight edge razor is an interesting one, since it functions as essentially a hybrid between a “pure” straight razor, and a single-blade safety razor. 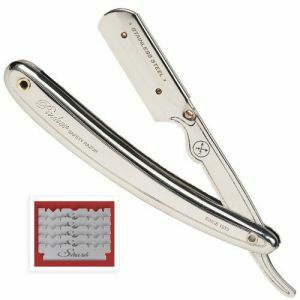 That trait makes it one among the best beginner straight razor. Beginners can get familiar with the idea of disposing and replacing blades as they become dull. For one low price, the Equinox comes with 100 disposable individually wrapped, stainless steel blades for longevity, and the ergonomic handle is designed in a way that is easy to wield. The blade has a rounded edge to minimize any cuts which makes it a good straight razor for beginners. Essentially, think of the Equinox as a stepping stone from safety to straight razors. Each blade can be used for 2 to 3 shaves, and has a good build quality and stability. They are made of quality stainless steel with an easy to open protection guard. It also provide a comfortable holding angle for shaving. 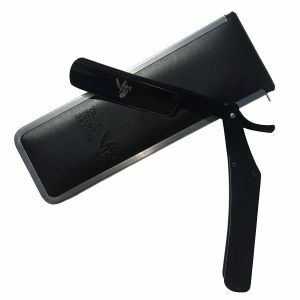 It is an excellent inexpensive option for beginners who want to experience a straight razor. But keep in mind they can still be dangerous and use only with extreme caution. Another great option if you don't want to start sharpening your own blades yet. Parker Razor, a family owned company, has been in the shaving business since 1973. All their razors are hand-crafted, and highly tested to ensure high levels of quality. The Parker comes with five single edge Shark blades to attach to the stainless steel blade arm, but you can easily upgrade to double edge when you're ready. The blade will remain securely in a place thanks to a snap lock, a feature usually found in high end razors. The weight is also well balanced for a comfortable shave. The razor arm can swing up to a full 180 degrees, allowing you to pick the most suitable angle. Even better, this angle will lock in place, again adding to the safety of the product. The Parker SR1 is a step closer to full-fledged professional straight edge razor shaving and you really can't beat the price, making it another best beginner straight razor. This is another good disposable-blade type razor for a good price. The quality of the handle and razor arm speak to the long history of Japanese craftsmanship, and are built tough for ease of use as well as durability. The razor body is made of surgical grade stainless steel and has a rounded exposure at the tip of razor head to prevent nicks. As with most to straight razors there is a learning curve for beginners and experienced wet shavers. They are sharp enough so use them with extreme care to avoid shaving off your skin. 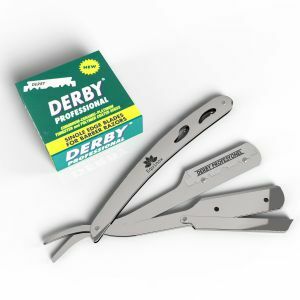 The pack also has 100 single edge Derby blades along with the razor, giving you a great price per shave. This razor comes in a nifty plastic pouch for protection, and is an overall great option to get started with straight edge shaving at a low price. Velvet Forge can be considered the most “vintage” straight razor on the list. All the above razors are shavette type razors but this one is a cut throat type. It will require the greatest skill, but also most likely the most precise and closest shave. This razor is unique due to its entire Jet black color body. Plus it comes with some excellent goodies, such as classy logo on razor, velvet bag and a leather carrying case. Unlike the Equinox and the Parker, you will have to sharpen this blade, so be sure to get yourself a good strop along with it. This is a good straight razor with a Japanese stainless steel blade, and lightweight handle, for precise use. The blade has a rounded end to enhance its beginner-friendliness. Velvet Forge makes a high quality product that will last you many years and has excellent customer support. 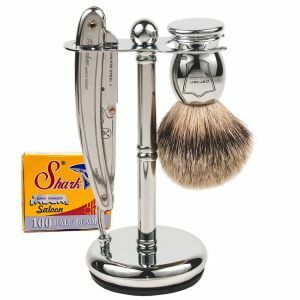 They offer lifetime sharpening service and provide useful tips to get the best out of your razor. For that, you'll be paying a bit more than the other razors on this list, but if you've read up and watched some good tutorials on straight-edge shaving, this would be a great tool to begin mastering this lost grooming art. 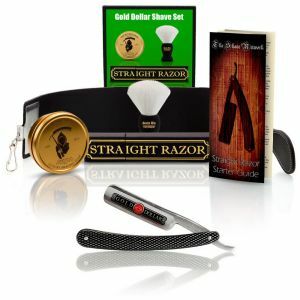 We list here some of the best straight razor kits in the market. They are excellent for beginners as well as experienced shavers who are looking for an entire kit for personal use or as a great gift for men. 1. Scale: By this, we refer to the holding part of the razor. It can be made of wood, plastic, resin or steel. Look for quality scales that are well balanced, lasts long, offer good grip and are comfortable to use. 2. Hollow: This refers to the blade's concave indents. They make the blade sharper, lighter, and overall easier to use. However, for a beginner, it's generally recommended to go for a less dramatic hollow, as this will reduce the risk of the blade bending, springing, and cutting one's face. 3. Width: For beginners it is better to go for a blade on the narrower side, around 5/8”. Wider blades can hold more lather, but are harder to handle. 4. Point: Begin with a round point. A square point would give you more precision, but is tougher to handle. 5. Straight razor or Shavette: This can be tricky for beginners who are looking to buy a straight razor. The first type of straight razors or cut throat razors are the more traditional razors that has a fixed blade. 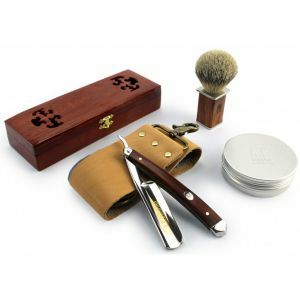 You will need to regularly sharpen with a stone or a leather strop to maintain the blade for getting a good shave. Shavette style razors come with a disposable blade system where you use a half of a double edge blade in the razor head. The blades can be replaced with a new one after every shave or a few shaves. They are popular due to easy maintenance and offers better hygiene. Shavette type razors are better for beginners as they are inexpensive, quite easy to maintain and offers a sharper shave with quality blades. Once you master the art of shaving with a shavette you can always move on to a cut throat razor! If you are new to wet shaving using straight razors you need to be very careful not to nick yourself. Make sure you understand all the details and steps on how to use a straight razor properly. No wonder they are called cut throat razors! Check this video that shows how to shave with a straight razor. Again, we strongly recommend you head over to YouTube and other written articles to get a better idea of how to shave with a straight razor, but after that, get a good beginner razor, be careful, be aware, and begin. 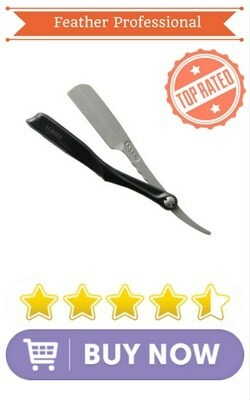 The Feather Professional is our top pick for beginners as it offers excellent quality at a good price point. For those who are looking for the best inexpensive way to get started can consider the Equinox Professional razor. Don't be discouraged by the first little cuts and nicks you get along the way: wear that blood as a red badge of honor, as you perfect the skill of shaving like your great-grandfather! The close shaves and meditative activity, as well as the personal satisfaction, are all worth it.